Dinosaurs meet the old west in How to Train a Triceratops! This adventurous chapter book is the perfect mashup of cowboys and dinosaurs. Josh wants to be the best dino-rider around, just like his idol Terrordactyl Bill, but a few things stand in his way of winning the annual settlement race. First, his trusty dino Plodder is a great dinosaur. He just isn’t fast. Second, the town brute Amos has Clubber, a fast ankylosaur. With the help of his friends Sam and Abi, Josh attempts to go for greatness and enters the race. Will Josh be able to roar past the others and become a dino-riding champ? 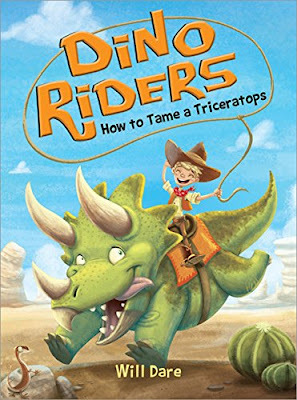 This dino-western is a fun read that will have kids coming back for more books in the series! If you’re interested in reading How to Tame a Triceratops, you can purchase a copy here on Amazon.